The slim and light Navman S30 3D is the entry level satellite navigation system to the new Navman S-Series. 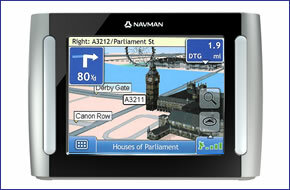 The Navman S30 3D is pre-installed with mapping for United Kingdom and Republic of Ireland. The Navman S30 3D provides 3.5-inch colour touch screen, with 2D or 3D moving maps display and includes full 8-digit UK postcode search. Navman S30 3D works straight out of the box and is easy to use. Hidden inside its slender frame is a host of features including speed camera alerts and an intelligent day/night display. The Navman S30 3D is perfect for anyone who wants secure, powerful navigation at an affordable price. Navman S30 3D has been discontinued. Accessories, spares and parts are still available for your S30 3D. The Navman S30 3D satellite navigation system features a crisp clear 3.5-inch colour touch screen, points of interest, speed cameras and intelligent day/night display. The Navman S30 3D also features turn by turn navigation with voice guided instructions and a full 8-digit UK postcode searches with 2D and 3D moving map display. The Navman S30 3D features maps of the United Kingdom and Republic of Ireland, including detailed street level maps of England, Scotland, Wales, Northern Ireland and Southern Ireland on the slim and compact Navman S30 3D. The Navman S30 3D is pre-loaded with a free trial of the Navman UK speed camera database. The latest safety camera data is fully integrated with the Navman S30 3D. Colour coded speed camera icons are displayed on the Navman S30 3D so you can easily recognise the type of speed camera on your route. You can also select your proximity range allowing you to decide when you should be alerted of an approaching speed camera. The Navman S30 3D has been designed to be Plug and Play, and as such can be transferred from vehicle to vehicle with ease by the user. The Navman S30 3D is powered with a 12-volt adaptor cable in-car (supplied) and attaches to your vehicles windscreen via the Navman S30 3D suction mounting bracket which is also included. The Navman S30 3D includes speed camera locations pre-loaded. Subscribe to monthly updates of speed camera locations for the United Kingdom. Subscription to the Navman UK speed camera database is priced at £34.95 for 1year or £69.90 for 3 years. The Navman S30 3D is complete with the latest Navman 2007.4 TeleAtlas maps providing detailed street level maps of the United Kingdom: 98 - 100% and Republic of Ireland: 95 - 100% coverage. House number information in the United Kingdom: 98 - 100% (GBR and Belfast) and Republic of Ireland: 70% representing a huge improvement on previous mapping data. TeleAtlas Maps provide high quality, detail rich maps, which in addition to street information include features such as route calculation, Points of Interest, Estimated Time of Arrival, and more. IBM compatible PC running Microsoft Windows Vista, XP SP2 or 2000 SP4 (XP MCE, XP x64, Vista 64 not supported), Internet Explorer 6 or higher, DVD drive and USB port. An Internet connection is required for software updates, subscription services and more. Although the Navman S30 3D has been discontinued, a number of accessories are still available to buy from ActiveGPS. These accessories and spares include: leather carry case, vehicle charger and windscreen mounting bracket. Question: I have a navman S30 3D satnav about 10 years old, and wondering if I can still update maps by an email link or is it too old now? Answer: The Navman maps we sell are not compatible with the Navman S30 3D. I would recommend that you visit/contact mio.com - Mio acquired the Navman brand a number of years ago and may be able to assist you? Do you have a question about the Navman S30 3D? Submit your question via our contact page.